Staff members from PCMS Design were absolutely delighted to receive a ‘Highly Commended’ award at the 2015 LABC Central Building Excellence ceremony on Friday evening, which was presented for the ‘Best Partnership with a Local Authority Building Control Team’. This was in recognition of the close links we share with our partnership authority, Central Bedfordshire Council. Our team attended the ceremony at Double Tree by Hilton hotel in Milton Keynes, which saw a gathering together of local construction industry leaders, clients and building control departments. 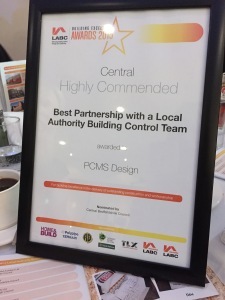 It’s not the first time that PCMS Design has been nominated for an LABC award. We have previously been finalists for ‘Best Educational Development’ and ‘Best Sustainable Project’. The presentations recognise building excellence in the delivery of outstanding construction and workmanship. LABC is an organisation which exists to represent all local authority building control teams in England and Wales. There are over 3,000 professional surveyors and building technicians within local authorities up and down the country. PCMS Design is a project management and architectural design firm working on a varied mix of public sector and residential projects. A new vacancy has arisen within our team for an Architect, Building Surveyor or Architectural Technician. The successful candidate will have a university degree or equivalent qualification in the field of architecture, engineering or building surveying, and a minimum of 3 years direct work experience in a building design capacity, including aspects of planning and specification. A good working knowledge of current construction techniques, statutory requirements (Building Regulations, Building Bulletins, CDM Regulations, etc) and non-statutory design guidance is essential, in addition to demonstrated experience in Computer Aided Design (CAD). Some local / regional travel may be required for the purpose of meeting with clients or contractors, and candidates will need to have a full driving licence. Depending upon the nature of the projects, there may be a requirement for a CRB check to be carried out. This is a full-time role but we are also able to consider part-time or freelance candidates. Back in 2011, we designed and project managed the construction of a new building for Clapham Pre-School in Bedfordshire. The Pre-School currently provides 40 childcare places for 3-5 year olds in two large bright playrooms, with ancillary facilities such as a combined kitchen and staff room, office and laundry room. Then in 2013, we were again asked by the Pre-School to secure planning permission for a large extension to the side of the building, the objective being to provide additional nursery spaces for 2-3 year old children. We are delighted that building works have now begun, with construction administration being provided by PCMS Design. 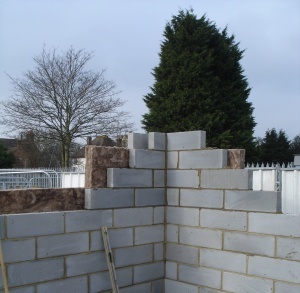 Princebuild Limited of Northamptonshire is the principal contractor. Our design incorporates similar features from the existing building whilst continuing the interior design theme of bright modern colours, and there is also a feature corner window to provide clear views out to the green play area beyond. The extension is due to be completed by the end of June, with new children starting pre-school shortly afterwards. This entry was posted in Bedfordshire, Early Year's, extension, planning consent, Pre-School, school extension on April 1, 2015 by admin.